Because I've had questions on the subject, here are a few scattered thoughts about egg replacer. You may have noticed that I use it in most of my cookies. I know I've mentioned it before, but thought it was worth doing a single entry on the subject. For a while I experimented with being vegan. It was interesting, from a culinary perspective, to be forced to cook without any animal products. And it turned out to be very valuable, since one of my relatives developed a severe allergy to milk; I've learned many tricks and substitutions that come in very handy. 1. 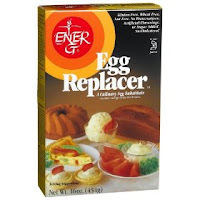 Ener-G egg replacer (the kind I use) is cheaper than eggs. Pretty self-explanatory, really. I'm a grad student, therefore I'm poor. 2. Ener-G can be kept indefinitely in a cupboard. It takes up very little space, and does not go off. So no checking of expiration dates, etc. is ever required. 3. To the best of my knowledge, egg replacer has never been linked to salmonella or any other food-borne pathogen. So I can eat cookie dough (which I generally prefer to cookies) without any worry about food poisoning. 4. To use Ener-G egg replacer, you add 1.5 tsp powdered egg replacer and 2 tbsp water... but I've learned that "water" can be interpreted as "any liquid I like." So by using egg replacer I suddenly have the ability to add different liquids without screwing up the liquid/dry ingredient ratio. This comes in very handy for things like rum cookies, the recipe for which I will post one of these days. I've also, as I've mentioned before, often used flavored coffee creamer in place of the water as a way of changing the flavor of cookies without having to invest in a ton of different extracts. Cheap, convenient, tasty. 5. Health. No eggs in a recipe = lower saturated fat, cholesterol, etc. Plus some people are allergic to eggs, so it's nice to be able to offer them something they can eat. When do I not use egg replacer? 1. Anytime eggs are a structurally essential part of what I'm cooking (cream puffs/eclairs, for example, to say nothing of angel food cake and the like). I know that the Ener-G people would like us to believe that it will always work as a substitute, but it's simply not true. 2. Brownies. I don't know why, but it never works for me. 3. For most cakes I use at most 50/50 egg replacer/egg. Many cakes need the extra richness provided by eggs, so I don't like to totally swap out the eggs unless I am really sure it's going to work. 4. Any really rich dessert (chocolate torte, cheesecake, etc). Again, the dessert often requires the richness of the eggs to really work. As a good rule of thumb with a new recipe, try a 50/50 swap, then go from there. If it totally fails, the recipe is probably not amenable to egg replacement. If it works justs fine, you can probably try a total replacement, preferably not when you're pressed for time (so if it fails you won't freak out). So those are my thoughts... I recommend giving egg replacer a go for those who bake a lot. It's convenient, cheap and easy to use. Ener G is potato starch. Potato Starch is a Night shade. Night shades cause Lupus Flair ups.